High Performance Home is a veteran and family-owned business looking to meet the home improvement needs of your family. We’re a full service, certified, experienced, hands on home improvement contractor. We specialize in exterior home improvements that add beauty and value to your home, as well as making homes more energy efficient and comfortable. 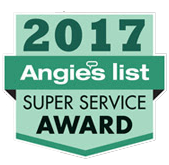 We’re a one-stop shop and an A-rated Angie’s List contractor and 5-time Angie’s List Super Service Award recipient. We service homes throughout Howard County, Frederick County, northern Montgomery County, and Carroll County. Unlike other businesses, you’ll never get a lengthy sales pitch or high-pressure sales tactics from us. We get the job done right the first time and have many repeat and referred customers.